The Nest at Finch Rest: Valentine Teatime for One - and some NEWS!! and a few sweet pieces of candy conversation hearts today. the costume designer for Downton Abbey. even if it is just me and only a simple half hour to myself. my sweet hubs brought me, too. that our eldest had on her tables at her wedding reception. sunny and cheerful winter's day! is the perfect little tea time break! So, we're all sooooooo happy! girlie luncheon places to celebrate and see the ring. This pic doesn't do it justice, it is incredible. It is a STUNNING RING and a stunning couple, too. No date set, they want to enjoy this a while. But of course I will keep you all informed! Hugs! was "the best gift he could ever hope for." and some cupid things around the nest. As always, thank you for you visit! Cool, congratulations to them both! Michele!! So happy for you and your daughter and new son-in-law to be!! What a wonderful Valentine's celebration for everyone!! By the way, love the white tulips your husband got you! Happy Valentine's Day, lucky girlfriend!! Congratulations!!! Beautiful ring indeed. Enjoy all the planning in the future for this special day. Wow, that is a stunning ring Michele, congratulations to your daughter and fiancee. 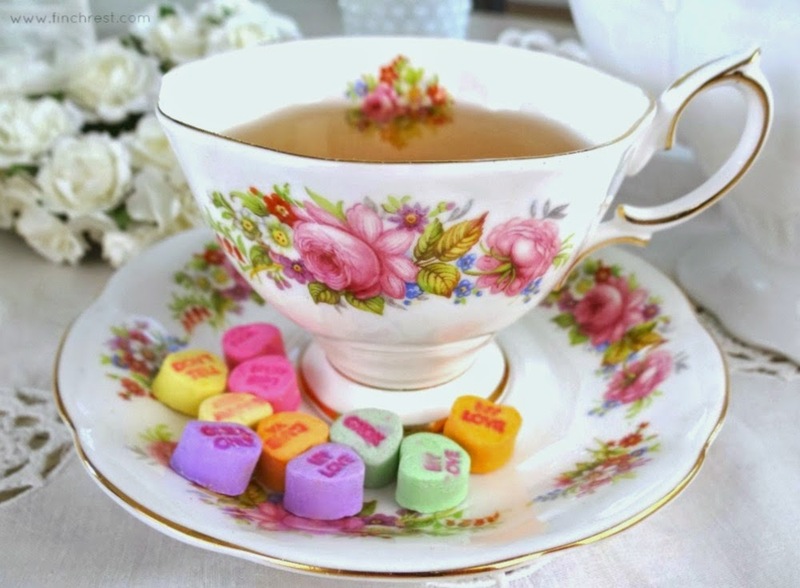 Oh yes, sweet Valentine tea - kind of takes back seat today, doesn't it? Great news. 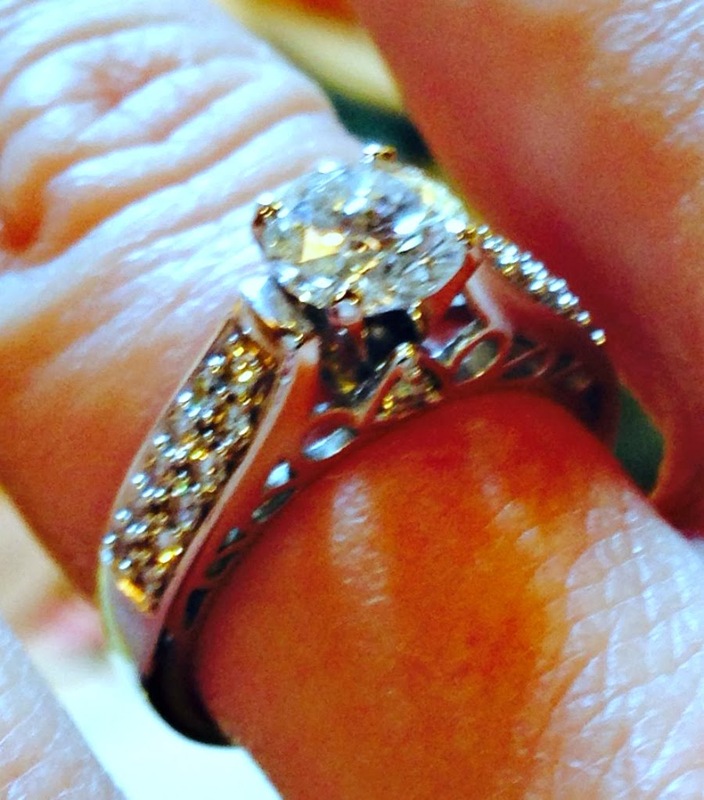 That is one Beautiful ring, Michele, now you have a wedding to do! How exciting. Congratulations to your daughter. I love your tea cup and saucer it is so pretty. Congratulations to your daughter and her special sweetheart, Michele!! That is wonderful news and such exciting times. The ring is gorgeous ❤️!!! p.s. Your tea is special, too! How sweet! Congratulations! The ring is beautiful. They should enjoy this engagement time a little bit before jumping into all the planning of a wedding. Wow Michele...That is a beautiful ring . Congratulations to your daughter. 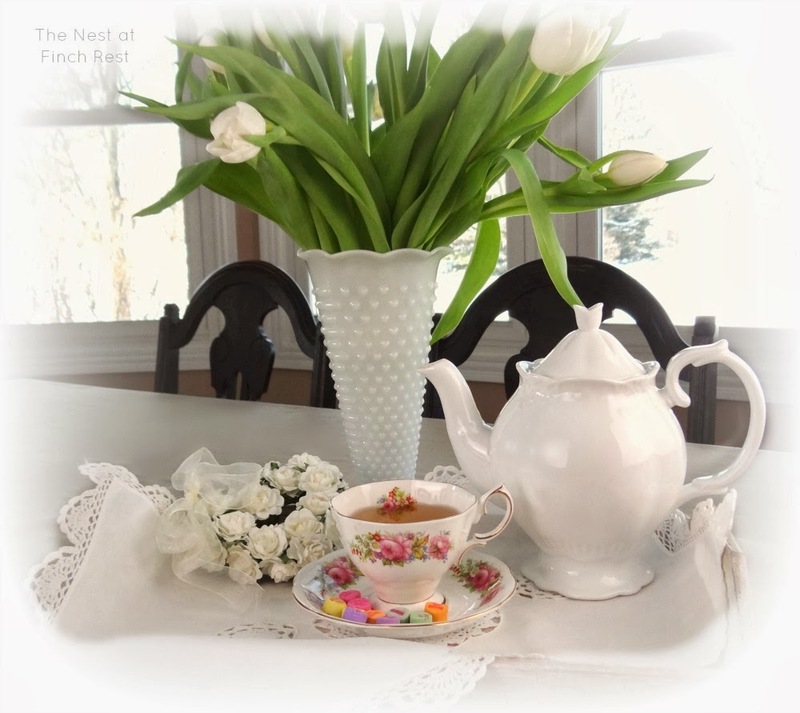 Love your tea and that gorgeous teacup and the pretty white tulips. Warm best wishes to the new couple! That is a gorgeous ring. My son married his bride the day after his birthday so that he would never forget his anniversary. Perhaps your daughter's fiancé has that in mind. Beautiful tea cup and magazine. I am featuring one tomorrow, but it's not as lovely as this. Your teacup is so pretty! And, congratulations to your daughter. My older daughter and I worked for 11 months to plan her wedding. It's a good thing we had that much time, because details changed many times due to various reasons. Enjoy! What lovely news, Michele! Congratulations to them both! 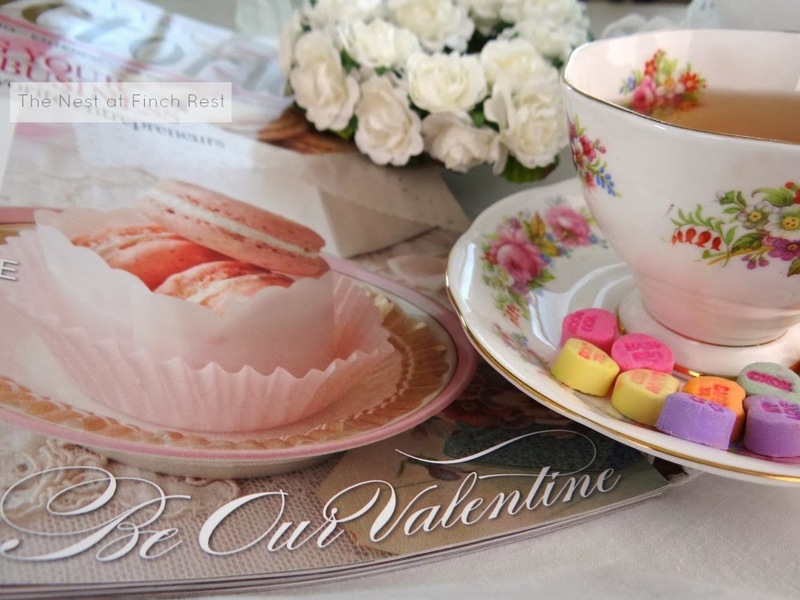 Your teacup is lovely and yes, the magazine is too.Thank you for joining me for tea and Happy Valentine's Day! Oh such wonderful news, congratulations to the couple and your family ! Best wishes to your daughter and groom to be! I haven't had candy hearts in forever. Oh how exciting! This news is major! Love your table, tulips and cup and saucer. Congratulations and best wishes to your daughter! 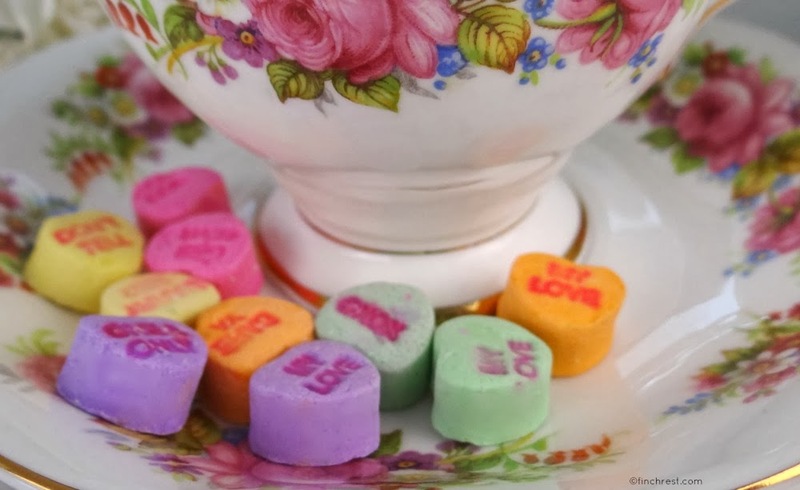 Love your teacup and it makes a pretty picture with the little conversation hearts! Happy Valentine's Day, Michele! How exciting your daughter is engaged! Congrats! Happy Valentine's Day! Congratulations to your daughter and her fiance! 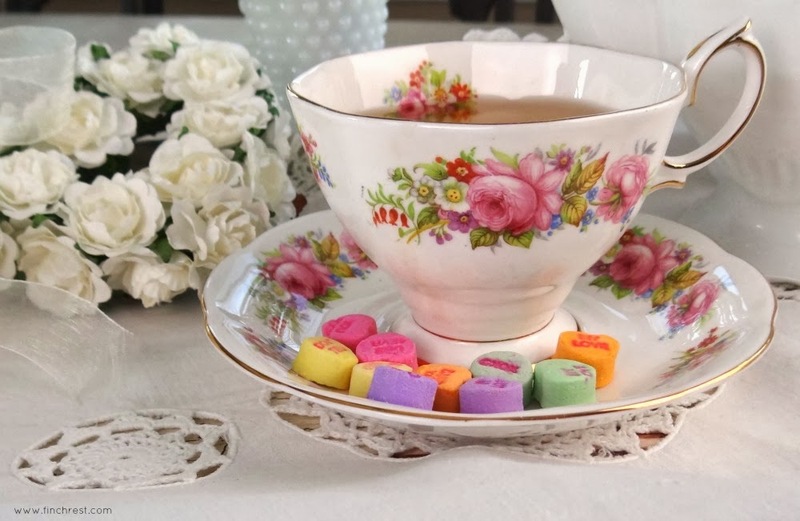 Your tea table is sweetly romantic with that gorgeous tea cup! The art work is stunning. The macaroons look incredible, can I have one please???? lol! That is very good news! Such a beautiful post. Congratulations to you all! A stunning ring for sure. Love the touch of green sitting there in your room. Oh green is such a welcome color at this time of year. The sweetest news ever. Congratulations! I love white tulips, and yours are absolutely beautiful. Hope you have a wonderful Valentine's Day. Congratulations! Love is in the air and how perfect to have it so close to Valentine's Day. It will always be a sweet, sweet memory. He sounds like a doll! How exciting! And just in time for Valentine's Day. The ring is beautiful. My congratulations to you all...great events ahead! Your daughter's news very exciting! This will be a lovely Valentine for them! Your beautiful cup and saucer by Royal Albert is wonderful to sit and enjoy sipping your tea! Congrats on the wonderful news! Happy Valentine's Day Michele. I can imagine how happy you were to get that sweet text ~ congratulations to them both and have fun with the planning! Love your tea as well. Oh my...that's wonderful! CONGRATULATIONS to you all! Congratulations on your daughter's engagement!! Your excitement is contagious and what a lovely way to celebrate with your blogging friends by serving us this most colourful and charming teatime!! I'm very happy for you all; enjoy, my friend!! What a special time for you! A big congratulations all around! My parents wedding anniversary is today. Sixty-eight years, though they have both passed on. I've been so out of the loop and have missesd visiting with you! I'm sure you are well cozed down! OMG Michelle!! Congratulations to your daughter and you too!! I'm so excited for you...can't wait for the pics and plans...as I'm sure you'll be sharing everything with us!! A great marvelous moment darling Michelle!! Congratulations to you all, from my heart! Lovely tea tray. Beautiful tea cup and photo. 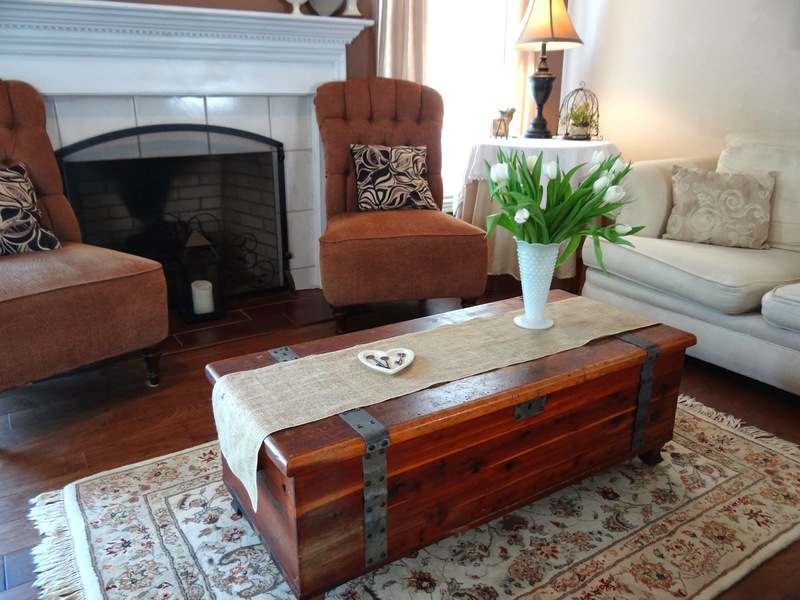 Your tulips are so pretty in the hobnail vase. I've always wanted some hobnail pieces. Congratulations to your daughter. That is a gorgeous ring. Oh the joy! Now the fun pf planning begins! Still remember the sweetness of our daughter getting here ring and then my son telling their story. He managed ot actually surprise her with her ring. Teatime looks beautiful, and only made better with macarons and Victoria. Please share with us at Pink Saturday. Beautiful tea time...but I think your news takes the cake!! Congratulations to the happy couple! The ring is gorgeous! What excitement for all of you! Oh how wonderful. What a gorgeous post and spectacular news. Congratulations.. Her ring is soooo beautiful. Let the planning begin! Enjoy every minute. I know you will. Ah, what a special time. I have a feeling we will see some fun posts about this...showers and flowers and teacups?